(Fantastic Four II#15 (fb) - BTS) - Susan Storm and Reed Richards had a son, Franklin Richards. At some point, the Fantastic Four's former enemy, Doctor Doom, became a hero and eventually married the Invisible Woman. (Fantastic Four III 2000 Annual/2 (fb) - BTS) - Samantha Dunbar lost her family, blaming herself for not being able to prevent their deaths. (Fantastic Four III#49 (fb) - BTS) - Franklin Richards of Earth-616, in an effort to save the life of his unborn sister, transported her to Earth-99315, where she was born to Earth-99315's Invisible Woman and Doctor Doom. (Fantastic Four III#15 (fb) - BTS) - Invisible Woman and Doctor Doom's child was named Valeria von Doom. (Fantastic Four III#16 (fb) - BTS) - Margali Szardos banded together with her companions Destiny and Legion to become the Defenders, feeling that they owed Earth a karmic debt for their past misdeeds. (Fantastic Four III#22 (fb)) - Even as a very young child, Valeria von Doom recognized her mother as beautiful and came to love her father, Victor von Doom. When Valeria took her very first steps, she recognized the gauntlets of Doctor Doom, who urged her on. Growing up, Valeria was often referred to by her mother as "her little miracle" and she became very close to her older half-brother Franklin, whom she called "Sparky." (Fantastic Four III#22 (fb)) - At age 12, Valeria was brought to the throne room of the Baxter Building, where she was formally invested as Doctor Doom's official heir. (Fantastic Four III#24 (fb) - BTS) - Valeria was trained in soccer by the famous Mia Hamm, who went on to coach the gold medal-winning U.S. women's soccer team. Hamm suggested that, with practice, Valeria could go on to join the team herself. (Fantastic Four III#23 (fb) - BTS) - Valeria also took up an interest in sailing and flying, winning a trophy race and earning a pilot/astronaut license from NASA at a young age. As the heroic Marvel Girl, Valeria befriended fellow heroes Rosetta Stone and Spider-Man. (Fantastic Four III 2000 Annual/2 (fb) - BTS) - Following the death of her family, Samantha Dunbar believed herself without salvation. Seeing a lost soul in Samantha Dunbar, Doctor Doom catalyzed and modified Samantha's latent mutant abilities until she functioned at the peak of human perfection. Doom then gave Samantha a new purpose as his bodyguard, Lancer. (Fantastic Four III#16 (fb) - BTS) - A great cataclysm struck Earth-99315, altering the shape of the universe itself. (Fantastic Four III 2000 Annual/2 (fb) - BTS) - Apparently during the cataclysm, Reed Richards, the Thing and the Human Torch perished alongside Doctor Doom in order to allow the Earth to survive (see comments). 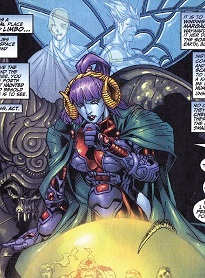 Despite being angry that she could not give her life instead of Doom's, Lancer was charged with protecting Doom's family as a last request from Doctor Doom himself. (Fantastic Four III#15 (fb) - BTS) - The Human Torch sacrificed his life to save Caledonia, who considered herself bound by honor to the Torch. (Fantastic Four III#15) - Less than a year later, at the Blue Area of the Moon, Alicia Masters worked on a sculpture commemorating the Fantastic Four's deaths, preparing to start on the fourth figure following Mr. Fantastic, Human Torch and Thing. Caledonia soon arrived and commented about how realistic the Human Torch statue looked before announcing that the Baroness von Doom and her children had arrived to view the statues' progress. Baroness Susan von Doom and her children Franklin and Valeria then entered Alicia's workspace, where she commented to Alicia that she wanted to see the statue of the Fantastic Four as she remembered them. While Susan continued to look over the statues, Franklin said hello to Mr. Fantastic-616, who was secretly observing Earth-99315 via a brief reality warp. Franklin commented that everything was for the best before Valeria asked about the Fantastic Four members present. Surprised that Valeria could also see the Earth-616 Fantastic Four, Franklin reiterated that everything was for the best before the image was disrupted by the arrival of Iron Man-616, who dissipated the image of Earth-99315 that the Fantastic Four had been viewing. (Fantastic Four III 2000 Annual (fb) - BTS) - In the years following the death of Doctor Doom, Lancer continued to protect Doom's family, providing emotional support for the grieving Baroness von Doom and even becoming close friends with Doom's daughter, Marvel Girl. Once a year, Lancer would slip away a day or two before her wedding anniversary to purge herself of built-up rage over her family's deaths and return looking like she had been in a war, never explaining to the Fantastic Four where she went or what had happened. Adoring Lancer, Marvel Girl never asked what had happened and Baroness von Doom did not seem to mind Lancer's brief disappearances. (Fantastic Four III 2000 Annual/2) - During one of Lancer's outings, Marvel Girl became curious and followed her, passing through the San Gerrano festival before locating Lancer at a nearby bar. Inside, Marvel Girl found Lancer taking on a large group of mobsters and when the bartender attempted to shoot Lancer with a pulse rifle, Marvel Girl dove in front of the blast, erecting an invisible force field around herself. Despite scolding Marvel Girl for interfering in her personal business, Lancer teamed up with Marvel Girl when the mobsters regrouped and together, the two heroes easily defeated the mobsters. Having dropped a photo of her family in the scuffle, Lancer was given it back by Marvel Girl, who asked about her family. Lancer revealed her guilt over her family's deaths and explained that beating up on criminals on her wedding anniversary allowed her to deal with the rage over her inability to save her family as well as reminded her of who she was. Marvel Girl reminded Lancer of the support she had given Baroness von Doom when Doctor Doom had died and Lancer commented that while people may die, families would endure. (Fantastic Four III#20 (fb) - BTS) - Marvel Girl was transported to Earth-616. (Fantastic Four III#23 (fb) - BTS) - Marvel Girl's entire bedroom was also transported from Earth-99315 and took the space earmarked as a guest room within Earth-616's Pier Four's infinite storage warehouses. (Fantastic Four III#16 (fb) - BTS) - As a result of the earlier cataclysm, the alien Kree race became the rulers of Earth. Some Kree became "pseudos," mockingly imitating Earth's heroes and began hunting down surviving humans, who eventually banded together and became stronger, fighting back against the Kree. Just as the humans were about to retake Earth from the Kree, the alien Acanti race arrived on Earth, carrying with them insectoid aliens that ravaged the planet. Both the Kree and the humans were afraid of the insectoid aliens, who assimilated anyone with superhuman powers into the collective genetic material of their queen. (Fantastic Four III#16) - Manipulating Earth-616's Mr. Fantastic's Fold Space Interceptor, Margali Szardos transported the Fantastic Four-616 to Earth-99315, where they saw Alicia Masters' completed statues, with Doctor Doom as the fourth member of Earth-99315's Fantastic Four. They were soon attacked by the Kree Avengers. Soon escaping the Kree Avengers by stealing their Quinjet, the Fantastic Four made their way to Earth, where they found a giant alien Acanti skeleton. Unsure what to make of this Earth where even the continents were in vastly different locations and shapes, the Fantastic Four were attacked by the Kree Iron Man, who had followed them. The Fantastic Four eventually crashed the Quinjet while attempting to escape the Kree Iron Man, who was soon killed by an arrow fired from the heroic Redwing and Lucas. Lucas and Redwing led the Fantastic Four into an underground bunker, where they were all attacked by insectoid aliens who sensed the Fantastic Four's superhuman powers. Using the distraction to attack the queen, Lucas and Redwing were joined by the Fantastic Four, who helped them destroy the queen and drive the insectoid aliens from Earth. With the insectoids defeated, Margali Szardos secretly transported the Fantastic Four away from Earth-99315. (Avengers Forever#11) - Giant-Man and Captain America of the Kree Avengers were transported from Earth-99315 to participate in the reality-spanning Destiny War on behalf of the enigmatic Time-Keepers. (Avengers Forever#12 - BTS) - Following the end of the Destiny War, the Kree Avengers were returned to Earth-99315. Comments: Created by Chris Claremont, Salvador Larroca and Art Thibert. 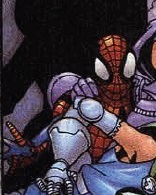 Earth-99315's Spider-Man was only shown in a photo where Marvel Girl was standing in front of him, blocking everything from the chest up. Given the costume design and the fact that the photo showed female heroes Marvel Girl and Rosetta Stone, it's possible that the Spider-character in the photo was actually the Earth-99315 equivalent of Earth-928's Spider-Girl (May Parker). It is difficult to confirm since most of the Spider-character was blocked from view. I chose to count the character as Spider-Man. While never stated in Earth-99315's appearances, it's very possible that the "Doctor Doom" that had married the Invisible Woman was actually Reed Richards trapped within Doom's armor, similar to a story that occurred on Earth-616 shortly after Earth-99315's first appearances. After helping destroy the cosmic Abraxas, who threatened all realities, Valeria/Marvel Girl was reverted to an unborn child within the Invisible Woman (Sue Richards)-616's womb, and was delivered soon after. She continues to exist as the much younger Valeria Richards-616. I had apparently resolved the issue circa 2009, but didn't remember it, nor did I make corrections to the alternate Earths listing. Earth-9903 is an erroneous designation for Valeria's reality, when I was under the mistaken impression that the reality on which Valeria grew up to become Marvel Girl was different from "Earth-Kree." Earth-9903 - wrong; Earth-99315 - right. Special thanks to Loki for the assist in getting the somewhat convoluted Earth-99315 history in order and pointing out the story in Fantastic Four III 2000 Annual that I had originally missed! An unidentified alien insectoid race arrived on Earth-99315, carried to Earth by the alien Acanti race. Shortly after the humans nearly took back Earth from the Kree rule, the Acanti arrived and the alien "bugs" swarmed over the planet. At first thinking the "bugs" were a new weapon unleashed by the Kree, the humans soon found that the Kree were just as scared of the "bugs" as they were. Seeing all humanoid beings as a food source, the alien "bugs" killed much of humanity excepting the superhuman population, who were assimilated into the genetic structure of the alien "bug" queen, who passed their superhuman powers onto the next generation of "bugs." 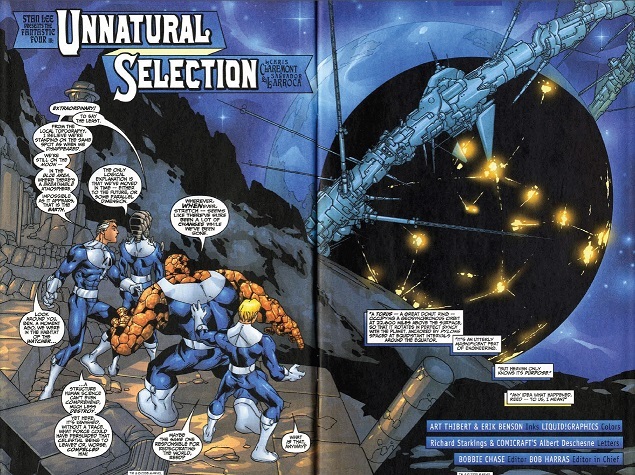 In an effort to quell the "bug" invasion, Earth-99315's Margali Szardos transported Earth-616's Fantastic Four to Earth-99315, where they learned of the "bug" invasion from the heroic humans Lucas and Redwing. 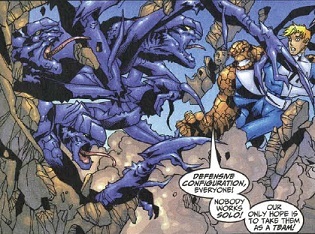 Almost immediately after Lucas explained the situation of the invasion, a group of "bugs" sensed the presence of the Fantastic Four and attacked. While the Fantastic Four battled the "bug" soldiers, Lucas and Redwing took advantage of the distraction to take the fight directly to the "bug" queen. Upon killing the queen, the "bug" hive was destroyed. Despite the victory, Lucas and Redwing mentioned that there were still more hives to destroy in order to take back the planet. The Fantastic Four were ready to aid them against the remaining "bugs," but Margali secretly transported them away from Earth-99315, their job on Earth-99315 complete. Due to their constantly upgraded genetic makeup, the typical alien "bugs" had superhuman strength sufficient enough to break through stone walls and were durable enough to withstand all but some of the strongest punches from Earth-616's Thing. The queen had those same abilities, albeit at much stronger levels, as she was able to bat the Thing away with little effort. Unfortunately, the queen seemed to be less durable than the soldiers, as she was killed using an axe and other bladed weapons. The Defenders of Earth-99315 consisted of Margali Szardos, Destiny and Legion, who all felt they had a karmic debt to pay for their past misdeeds. Becoming Earth's champions as the Defenders, they set about protecting the Earth. Margali eventually summoned Earth-616's Fantastic Four to Earth-99315 to help repel an insectoid alien invasion and once the task was complete, she transported them away. The Defenders had many of the same abilities of their Earth-616 counterparts. They were: Margali Szardos (center), Destiny (top left, bald woman), and Legion (top right, with styled-up hair). The Kree Avengers were a group of Kree "pseudos" who impersonated former Earth heroes. 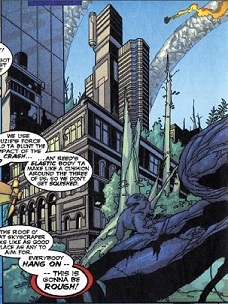 As with many of the "pseudos," they hunted humans and upon locating Earth-616's Fantastic Four on the moon, they attacked. The Fantastic Four escaped to Earth by stealing the Avengers' Quinjet but were followed by the Kree Iron Man, who was killed following a battle with the Fantastic Four by an arrow shot by the human Lucas and Redwing. The Kree Giant-Man and Captain America were later transported from Earth-99315 to fight on behalf of the enigmatic Time-Keepers during the Destiny War. Once the war had ended, they were returned to Earth-99315. The Kree Avengers possessed superhuman powers similar to those of Earth-616 Avengers. 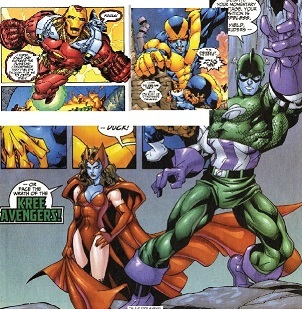 They were (clockwise from top left): Kree Iron Man, Kree Giant-Man, Kree Captain America and Kree Scarlet Witch. Franklin Richards was a young adult member of the Fantastic Four. Presumably, his upbringing was much the same as the Earth-616 son of Mr. Fantastic and Invisible Woman up until Doctor Doom became the leader of the Fantastic Four. After his half-sister Valeria was born, Franklin became close to her and was given the affecionate nickname of "Sparky." When Earth-616's Fantastic Four caught a glimpse of Earth-99315 due to a brief reality warp, Franklin was able to see them and tried to explain that no matter how bad things seemed, Earth-99315 really was for the best. At that point, the glimpse of Earth-99315 was disrupted by the arriving Iron Man-616. Franklin presumably had the same powers as his Earth-616 counterpart, albeit with more control of them with age. Earth-99315's Spider-Man appeared to be essentially the same as his Earth-616 counterpart. He befriended Marvel Girl and Rosetta Stone, and posed for a picture with them following a large battle. --Fantastic Four III#23 (fb) - seen in photo only. Susan von Doom was originally the heroic Invisible Woman of the Fantastic Four and married to Reed Richards. At some point, their old enemy Doctor Doom became the heroic leader of the Fantastic Four and eventually married Susan, giving her the title of Baroness. Sue eventually had a daughter, Valeria (who had been transported to Earth-99315 by Earth-616's Franklin Richards), with Doctor Doom. Once Valeria was old enough, the Fantastic Four reformed with Sue, Valeria, Sue and Reed's son Franklin, and Doctor Doom as leader. Following Doctor Doom's death, Susan became a political representative of Latveria while Doom's bodyguard Lancer and Caledonia protected her children. She would occasionally allow Lancer to leave once a year. When Alicia Masters sculpted statues of the original Fantastic Four (with Doctor Doom in place of Invisible Woman), Sue visited Alicia to see the statues before Doom was added so that Sue could see them as she remembered them. Unbeknownst to her, those events were observed by Earth-616's Fantastic Four via a brief reality warp. Unbeknownst to the Baroness, her daughter Valeria followed Lancer when Lancer took her yearly leave while the Baroness was meeting with the U.S. President in Washington.